Member of the Companions Catholic Order, helped form local women’s organisations in the Transvaal region and in 1984 was elected president of the Federation of Transvaal Women (FEDTRAW). 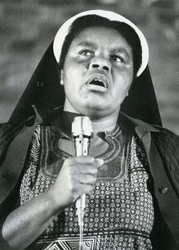 Sister Bernard Ncube was born in Johannesburg in 1932. She attended Roma College in Lesotho, where she received a diploma in Theology and in 1955 she entered the Companions Catholic Order, thereafter teaching until 1960. During the 1970s and the 1980s, Sister Ncube helped form local women’s organisations in the Transvaal region and in 1984 was elected president of the Federation of Transvaal Women (FEDTRAW). Sister Ncube was detained six times under emergency regulations, including once when she spent three months in solitary confinement in 1986. When her cause came to international attention, she was freed but was rearrested with a number of other people, and charged with sedition and subversion. These charges were however withdrawn by the state when no substantial evidence was found. In 1989, Sister Ncube was part of the United Democratic Front (UDF) delegation that went to meet with President George Bush of the United States of America. From 1991 she served as a member of the National Executive Committee of the ANC. In 1994 she was elected a member of Parliament where she chaired the committee on Arts and Culture Science and Technology. She was elected as the mayor of the West Rand region of Johannesburg in 2002. She has been referred to as being an unorthodox nun, who argued for abortion during her participation in the debate for the Arbortion Bill. Sister Ncube died in Edenvale on August 31 2012.